This web site is dedicated to Malcom McLeod (1740-1785) from Little Balernaig (now Balernock), Row (now Rhu), Scotland and his descendents. 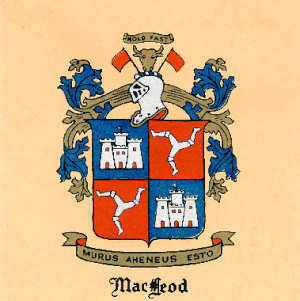 We have traced our ancestors back to Malcom McLeod, but have little information on Malcom or his ancestors. If you have additional information on Malcom or one of our ancestors that is not listed on this site, please contact us. Information contained on this site was compiled from a variety of sources, including, but not limited to: family history, census information, newspaper death notices, tombstones, and other genealogy websites. Whenever possible the source of the information is listed using [#] that is listed on the Source page. In most cases, you can click on the [#] and view the actual document. This web site is formatted for a general audience and designed to tell the McLeod story. If you are interested in the more traditional genealogy format, please use the McLeod Genealogy link on the top right of this site. We will keep a log of updates and new information about the McLeod family as the site is updated. Please feel free to comment and add information in the Update and Comments section.